A few interesting reads and listens from last week. The New York Times Magazine’s education edition included a long, very interesting look at education in Michigan where they gambled on charter schools and “Its Children Lost”. It’s a story of lax regulation and oversight, coupled with a concerted effort to privatize public schools, led by the current federal Secretary of Education. Two podcast episodes that explain in clear language why a do-nothing Congress can actually harm people. Planet Money has three examples our legislators risking the American economy by failing to pass a budget and risking the good credit of the country by playing chicken with the debt ceiling. The third segment addresses immigration and DACA, as does a short edition of DecodeDC, in which they fact check Jeff Sessions. Spoiler: he’s mostly wrong. In-between watching continuous coverage of Hurricane Irma, read about the men and women who fly aircraft into the middle of those storms to gather crucial information for scientists and forecasters. We often take all this for granted but collecting that data is tricky, dangerous, and very necessary work. Related to that, the BBC programme (British spelling :-) More or Less explains why the phrase “one in 500 year storm”, used so frequently during the coverage of Hurricane Harvey, has very little meaning. By the way, More or Less does a very good job of explaining those kind of statistical measures used by the media, in a short and very interesting weekly podcast. With all the stories about data security this week, Motherboard explains why you should never post pictures of your airline tickets or even house keys on social media. Their warning should also extend to any documents that include numbers or barcodes that contain identifying information. If you teach, you may want to explain this to your students as well. Finally, National Geographic offered a couple of interesting pieces this week, complete with great images, of course. One is a photographic essay of abandoned, decayed resorts in Pennsylvania and New York, side-by-side with post cards of the same scenes. Very creepy. The other profiles a small city in China (where a population of 1.2 million is “small”) that produces “60 percent of the worlds cheap consumable goods”. 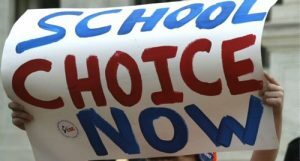 With the new administration pushing the privatization of public schools, headed by a Secretary of Education even less qualified than me, you hear from a lot of advocates for “school choice”. They tell you that if all parents had the option to send their children to any school of their choice – charter, private, or public – all would be well with American education. Or at least scores on the NAEP and PISA tests would skyrocket, which is about the only way most school reformers understand learning and student “achievement”. The Secretary and her friends in the charter school industry maintain that picking a school should be like any other purchase in the free market. After all you have lots of options when it comes to buying a car and many places to buy one. Why not offer at least a few choices when it comes to something even more important? There are some major issues with a “free market” system for something that should be a public good, more than enough for several long posts. However, the specific concept of “choosing” as school for a child includes a big problem I haven’t seen discussed much. Unlike finding a new minivan, the vast majority of parents don’t have enough information about the complexities of school to make a real, informed choice. And many, if not most, don’t have the resources, expertise, or time to become sufficiently informed. That’s not a criticism of most parents. Unless you’re as rich as DeVos, parents don’t have a lot of time to spend on research. But schools, private or not, also don’t make it easy to comparison shop. Some work very hard to hide any meaningful data on their programs, outcomes, and finances. Public schools have been known to fudge the numbers. And the information provided by most private schools and charters often comes in the form of marketing brochures. Material that’s more about recruiting than transparency. In addition to having enough information is providing it in a form that can actually be compared. When you research that new car, most of the basic metrics have common units and language that can be lined up in columns. You also have some relatively independent organizations that test drive vehicles and speak a common language about the vehicles. No one “test drives” schools. There are few common metrics between all schools. Much of the common language – world-class, mindset, high tech, innovation, STEM – is at best vaguely defined. Test scores can’t be compared because not all schools use the same evaluations and students in charters are often not required to take them. Even graduation rates are not measured in the same way. So, the goal is to allow every parent in the US to decide where their children will receive the basic education that will impact the rest of their lives. How do we provide them with the necessary, relevant, and comparable data to do that? Something more than websites and flyers with pictures of happy kids and competent-looking teachers, mixed with important sounding educational jargon. That’s a serious question. One that I rarely hear the advocates of school choice address. Because without sufficient, understandable information, how does anyone make a critical decision about something as important as a child’s education? Hey, here’s a radical idea! How about if we spend more time and resources on improving pubic schools for all children everywhere in this country? That too is a serious question. With Charters, Everyone Wins. Almost. doing a good job with completing their somewhat outdated mission.2A long rant for another time. A great investigation by ProPublica provides a great deal of evidence of just how bad charters can be by looking at “alternative” charter schools in Florida, Louisiana, Pennsylvania, and elsewhere. They found that many of these schools are simply being used to improve the accountability ratings of public schools, and the bottom line of charter corporations. In the case of the Florida charter schools, students who dropped out were coded as “leaving for adult education”, which means that the public school they were transferred from did not have to count them on their dropout records. Their score remains high, the charter gets paid for the enrollment, and everybody wins. Except the student, of course, most of whom are minority children, often with limited English skills or disabilities. Actually it’s very clear. They are supposed to warehouse students who likely will not pass the standardized tests. And to earn a profit for the companies who run them. While the ProPublica researchers focus their story on Florida, take a look at the map of Michigan, where the new Secretary of Education has invested a lot of her money and time into charter corporations. It shows a “steep rise in the alternative school population”, largely due to charter schools. Something being repeated in other states, and that the Secretary would like to expand nationwide. Although the whole piece is rather long, it’s well worth your time. In addition to lots of data, they also include some compelling data stories about victims of these “alternative” programs, which are little more than holding cells for students who don’t fit into the narrow “accountability” culture that’s been forced on American public schools over the past almost two decades.